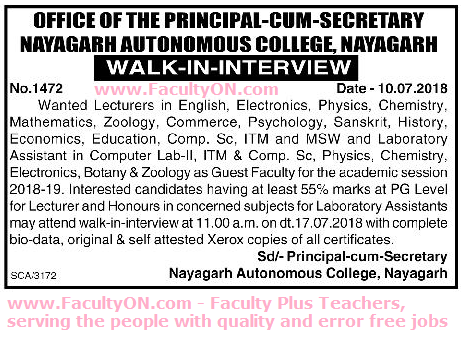 Nayagarh Autonomous College, Nayagarh has advertised in the SAMAJA newspaper for the recruitment of Lecturers / Lab Assistants jobs vacancies. Interested and eligible job aspirants are requested to walk-in on 17th July 2018. Check out further more details below. College Profile: The erstwhile Princely State of Nayagarh occupied a prominent place in the Freedom Movement of India for its bloody Struggle against the British rule. After being liberated from the Royal Shackles, it joined the national political mainstream in 1948 a year after the independence of our country. Subsequently, along with three other neigbouring princely states, Nayagarh (now a district) formed a part of Puri district as a sub-division in the state of Orissa. How to Apply: Interested and eligible candidates are requested to appear for Walk-in interview along with CV, originals & self-attested copies of certificates and recent PP size photo to the following walk-in address.